Where do I even start with this one? I have read every single one of Picoult's books and absolutely love her. I have not yet read one that didn't leave me sobbing by the end. So why do I insist on finishing her books in public places? I concluded Leaving Time at the gym: Thank goodness I was a sweaty mess because it provided a nice disguise to mask all those tears! Leaving Time was so compelling! I wouldn't couldn't put it down. Being a fan of Picoult, I know that she does a lot of extensive research regarding the subjects of her books. Leaving Time was no exception. This book has a heavy(no pun intended) Elephant background. We are given an amazing lesson on how the majestic creatures' memories work. I was just as engrossed in those portions of the book as I was of the main, fictional story. 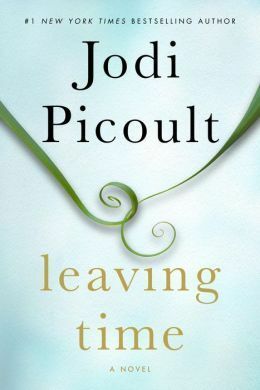 Jodi Picoult is known for her multiple perspective story-telling and this novel was no exception. We experience all sides of the story from 4 POV's: Jenna, the Daughter, Alice, the Mother, Serenity, the Psychic and Virgil, the ex-cop. Each are told in the present tense except for Alice. Her story starts from the Beginning of her work as an Elephant Researcher, leading up the story's main event. Which will leave you on the edge of your seat! Buckle your seat belt because Leaving Time will take you on one wild adventure. Just as you think you're getting somewhere, or on to something, Jodi Picoult puts her classic spin on things and leads you down a rabbit hole of "What Ifs" and Who-Dunnits". Another Masterpiece by Jodi Picoult! One that will take you through an epic reading experience. Keep the Kleenex close by and prepare your jaw to drop! Jodi Picoult does give in depth information during her story and is an amazing writer. The only one I couldn't finish was the one about the holocaust. It was just too upsetting for me. We’ll be vigilant; if we see something we think is serious and credible, nike air max pas cher then we’ll alert the public, but for now my recommendation would be that people go to the movies,” Obama said. This is our rendezvous with destiny, air max pas cher as it was for my grandfather’s generation when he enlisted to fight Japan in December 1941. Now, millions of strong-bodied young men and women will answer the call. 2015 nike air max pas cher We will take hacking lessons. We will learn how to encrypt. Here is the Saxon manufacture finally replica breitling watch showing off all of its expertise in one timepiece — a hyper-complicated watch executed in a very replicas de hublot traditional way. Click here for more detail on the watch. Survive the Night- A Maze Runner Snapchat Event!